Just when I thought it couldn't get any better... some of my favorite Etsy artists - Jonathan Barstale, Nina Morris and Monty Dean have teamed up with Snuggie to create this A-M-A-Z-I-N-G handprinted woodlands-themed Snuggie. Visit Snuggie, mention "Heart Handmade" and you get yours for FREE!!! Limited one per household. Oh my god, you seriously *almost* got me with this one!!! Really. Oddly, it was the "free" part that made me go "waaaaaiiiiiitttt....."
This is too freakin' funny! Have you seen the Peekaru? It's like a Baby Snuggie. It was on Worthington Wire last night- so creepy looking! And that's no April Fool! too funny! I was completely fooled. This is sooo funny! I was fooled too! LOOL Love it! Have a lovely merry happy day and love to you! I wouldn't think much of the "natural dyes" considering how awful and synthetic the actual snuggie fleece is. 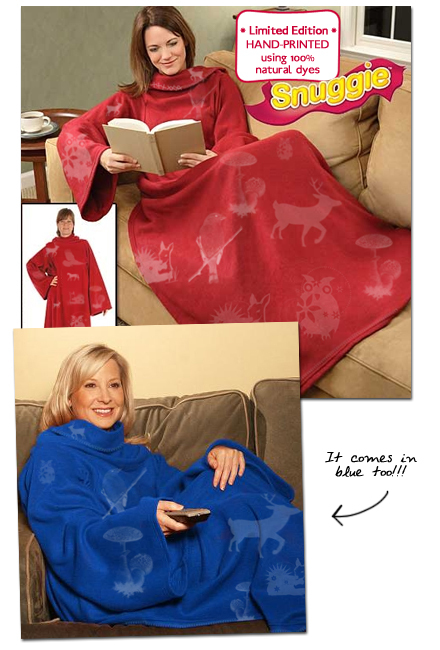 Would be great to make an organic snuggie from scratch instead! Ha ha happy April fool! I was fooled at this because it said free ha ha i nearly clicked on it until i read everyone else's posts i dont even like it thats how stupid i am! That is so. very. funny! You got me. LOL - Thanks for the laugh. The snuggie never fails!! I'm glad I made some of you laugh today! fooled :/ I'm Brazilian. we have a saying, which will prob not make sense in English, but here it goes: If it's free, even an injection on the forehead. holy cow, this has got to be the most amazing blog post e-ver. oh hahahaha! You fooled me!